With 2015 coming to a close, it’s time to reflect back on some of our favorite cakes from weddings we were fortunate to be apart of. A cake can be simple and elegant all the way to telling the story of the couples love. Traditionally, cakes were white and had a simple design, however, that’s no longer the case. 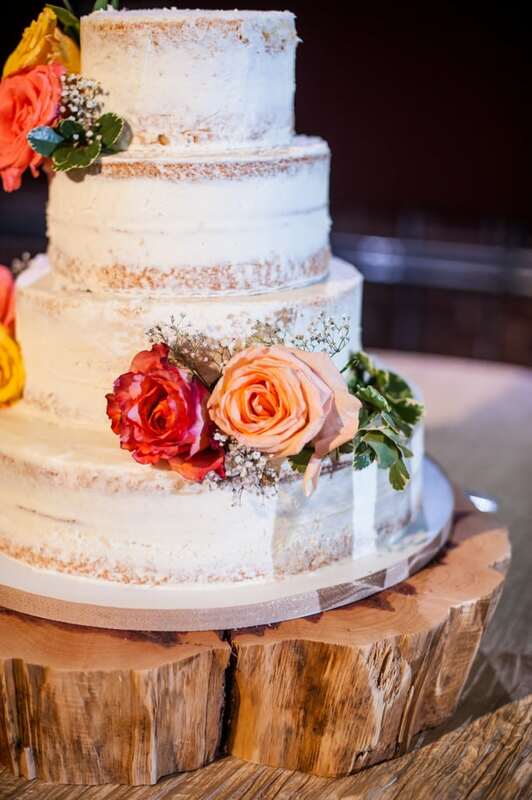 Couples are taking great leaps and risks with their cakes and we love it! Don’t over look your cake, instead make it something special; something to remember. Here are some of the best cakes of 2015. You can’t help but look at this cake from Magic Muffins Bakery and smile. Matt and Haley added personal touches by having their monogram placed on the forth tier of the cake. The delicate design and the large roses give the cake an elegant and sophisticated feel. Photographed by Colorbox Photography and placed on our gold sequin linen this display is nothing less than breath taking. And because we couldn’t pick just one . . . 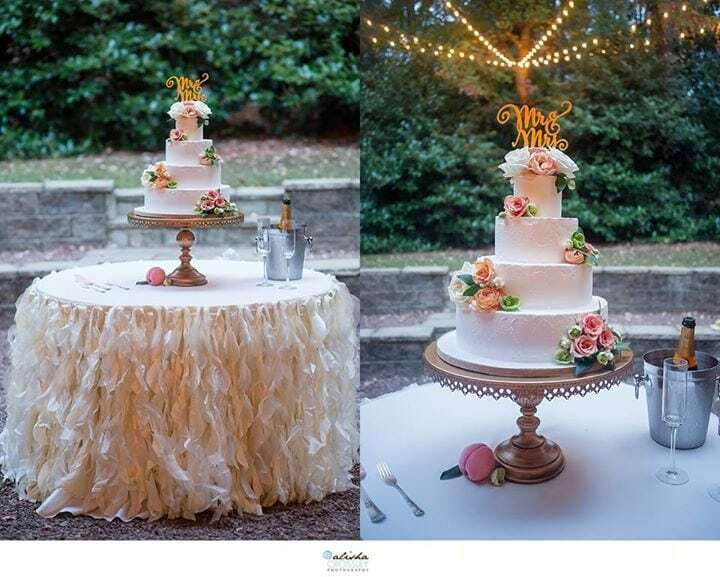 This beautiful cake, by Donna Scott, was featured at Amy’s wedding in May and photographed by Jan Shadix Photography. We love this design because of it’s elegant and timeless feel. Perfectly paired with of our Ivory Rosette linens, it adds a beautiful yet subtle touch to the room. 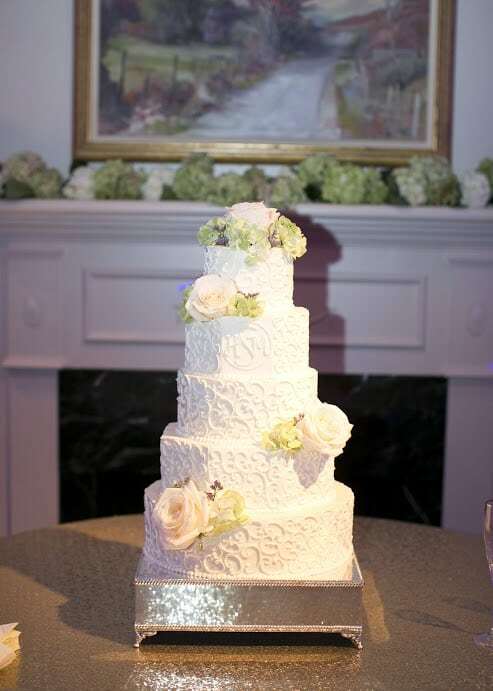 Next on the list is this simple yet elegant cake featured at Abby’s American Village wedding in February. Christian Terrell from Pen and Pastry did an amazing job! DuCastel Photography was able to capture the perfect simplicity of the design while letting the color of the flowers pop off the cake. The cake may be classic, but paired with our silver sequin linen, this table display as a whole is far from ordinary! One might think that the Naked Cake would be easy to master but I’ve heard from Birmingham bakers that it is harder than it seems. 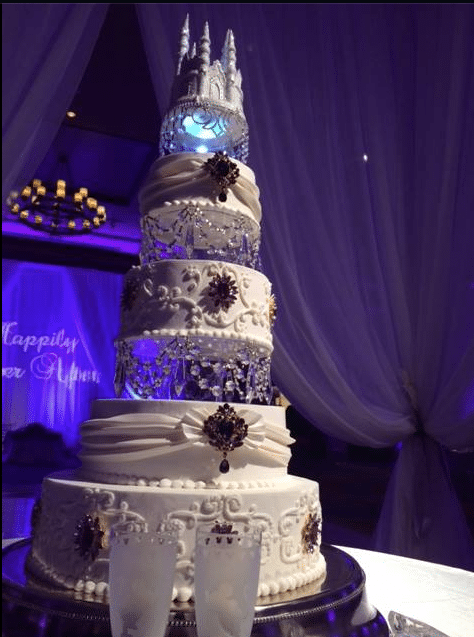 Cakes by Kim put together this beauty for bride Cessie’s Iron City Reception. We just love the simplicity of this design, wooded cake stand, champagne crinkle linen how the flowers compliment it all so well! 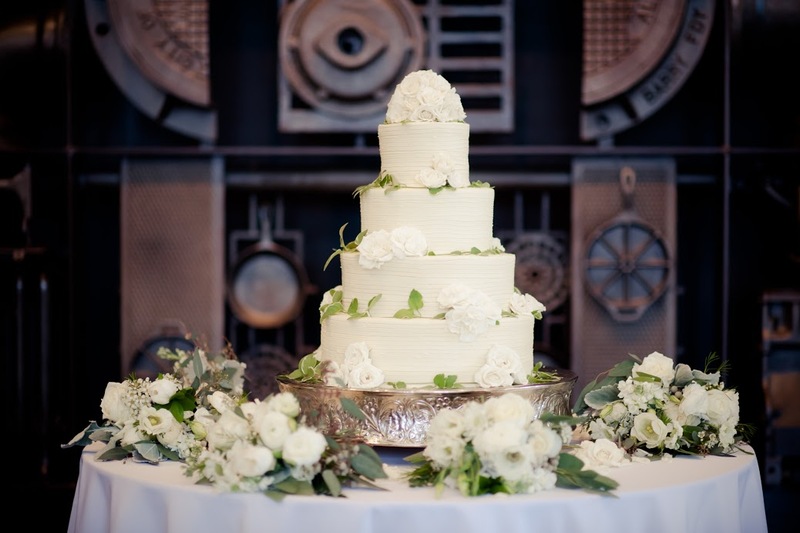 This array of flowers paired with a simple four tiered cake from Olexa’s, the detailed industrial backdrop of Vulcan Park, makes for a stunning display. Showcased at Lizzie and Mason’s wedding on top our white premium polyester linen and photographed by Allision Lewis Photography, it is clear how many elements had to work together to make this picture come together just right. 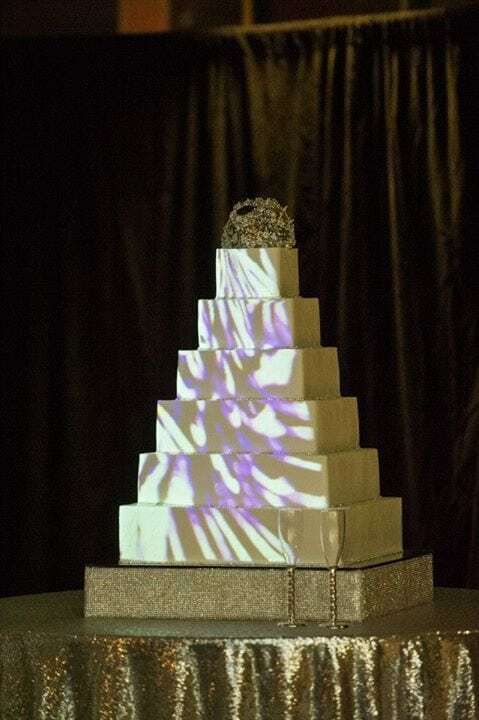 This modern square tiered cake, from Barb’s Cakes, was created in collaboration with JAMM Entertainment to have a special design projected onto the cake. We love this new modern take on cakes using technology to bring the picture alive. 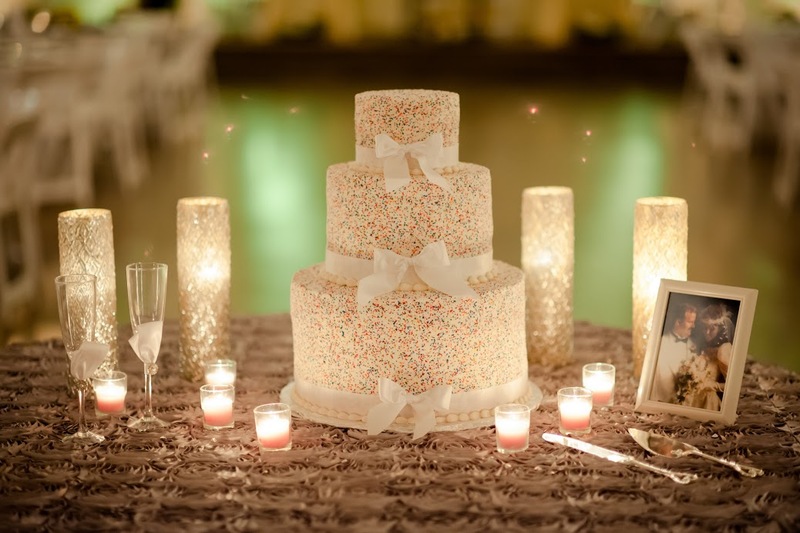 Photographed by Mark Broadway this beautiful cake lights up the room, literally. Holloway Productions captured part of the light show in action at minute 3:19. A themed caked is always a surprise to guests and a great way to show the personality of the couple or bring together the theme of your wedding. This Disney themed cake was created by Barb’s Cakes and featured at an AK Brides recent wedding. 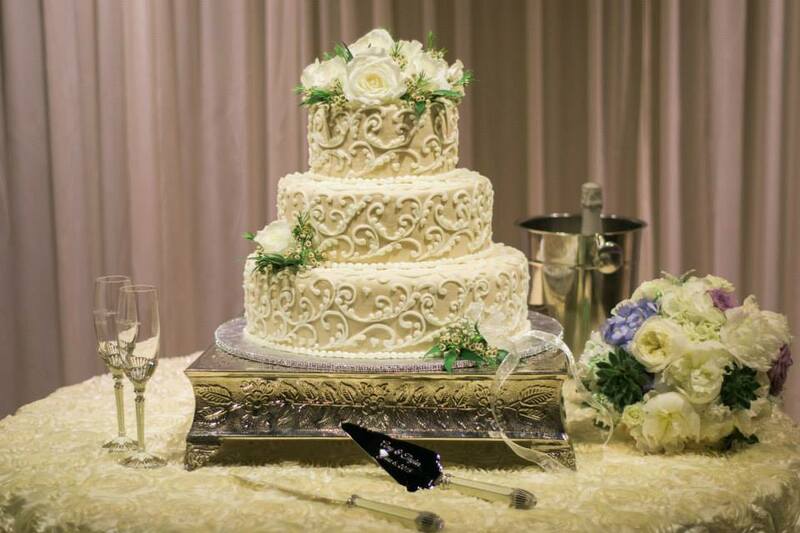 This elegant cake and display was featured at Kevin and Christina’s wedding and photographed by Alisha Crossley Photography. The entire table comes together with the cake from Cakes by Kim and our Whispering Willow linen to create a timeless and delicate look. Becky’s Brides did an amazing job helping Christina pull all her amazing ideas together! Kelsey and Ryan chose a very unique cake for their big day. This colorfully speckled three tiered cake, from Dreamcakes Bakery, is eye catching yet simple at the same time. It’s beautifully complex and is a memorable point of the evening. 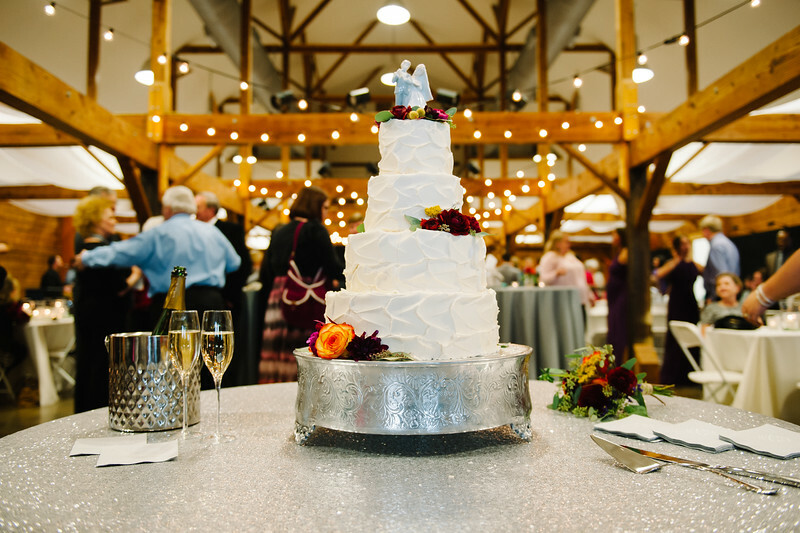 Allison Lewis Photography did a wonderful job by capturing the colors and light surrounding this cake. Choosing the right cake style can be a difficult task. These top cake styles show just how many options there are now. Cakes are no longer just a traditional romantic white cake. Colors, technology, flowers, and props are all apart of cakes today. It’s a great opportunity for the bride and groom to showcase themselves and their love. So whether you want a more traditional look or a modern take, your guests are sure to love whatever you surprise them with and love seeing the couple express themselves.